All of us have different activities in our lives and at some point, we lose different necessary vitamins in our body as we exhaust ourselves in our different careers. 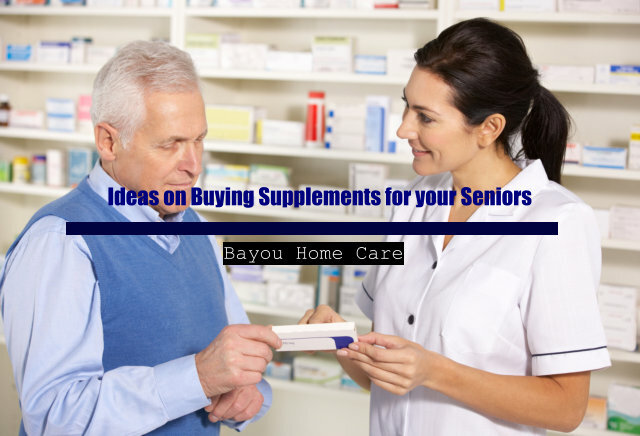 Same goes for seniors, they also need extra help from supplements whenever they go outside and deal with different people or even just by doing different activities at home with your provider of home care in Louisiana. Doctors know best in terms of medicines and supplements. The first thing we can recommend you is to talk to your doctor regularly. Let your elders express their problems and ailments to them so that these concerns will be dealt with accordingly. From your doctor’s advice, you can do your part from there. This is what most family members who are also taking care of their elderly loved ones should primarily do—be well-informed by doing some research. With the proliferation of the information over the internet, you can always do some research on different trusted networks. We are not saying you trust them; you can only take heed of those things that you may also talk to with your doctor. Most supplements always brag naturalness of their products. Of course, they should do that for advertisement’s sake. But with respect to this form of advertisement, the compounds and ingredients placed in these supplements may not always be safe for your elders in a sense that they might be allergic to some ingredients of these herbal medicines. The family members should not the what-not of these supplements to be able to improve their health in a short span of time. All of us have a trusted brand. Yes, it would be best if you have a trusted brand of medicine for your loved ones. But for those who do not have, you must be extra careful for your elderly loved ones’ lives are at stake. Also, be careful with the prevalent spread of fake supplements. You can ask your provider of home care in Louisiana to have a regular pharmacy instead so that your pharmacist would be able to also take note of the progress and effects. Bayou Home Care is a quality provider of home care in Louisiana who is ready to help with your errands and needs. With the tips above, let us help you with the buying of these supplements and we can also get your family doctor’s approval with these supplements. With Bayou Home Care, the home care needs of your elderly loved ones will be convenient and hassle-free!